The Victoria Lines, as the wall was called, runs for some 12 kilometres from Madliena in the east to Fomm ir-Rih on Malta’s west coast. It follows a natural geographical fault, which made its construction a relatively easy one, as the wall is mostly built along cliff edges. Along its length and where the fault was breached by valleys, robust forts and batteries were built. Britain took control of Malta in 1800 upon being invited to do so by the Maltese; after the former had helped the islanders evict Napoleon’s troops following the short and turbulent two year stay of the French. What they found was a well-fortified island with a heavily defended port area. Nonetheless the British were worried about the possibility of invading forces landing on the accessible shores of the north of Malta, since the Grand Harbour area was deemed vital to their interests, being their fleet’s main Mediterranean base and therefore their major source of power in this region. The British answer to this problem was an ambitious if somewhat mad one. They set out to build a massive wall which practically cut off the densely populated south from the more rural and sparsely inhabited northern area. The Victoria Lines, as the wall was called, runs for some 12 kilometres from Madliena in the east to Fomm ir-Rih on Malta’s west coast. It follows a natural geographical fault, which made its construction a relatively easy one, as the wall is mostly built along cliff edges. Along its length and where the fault was breached by valleys, robust forts and batteries were built; Fort Madliena, Fort Bingemma and Fort Mosta being the major ones – with the latter still in use as a munitions depot by the Armed Forces of Malta. Construction was started around 1870 and the line was completed by 1888. 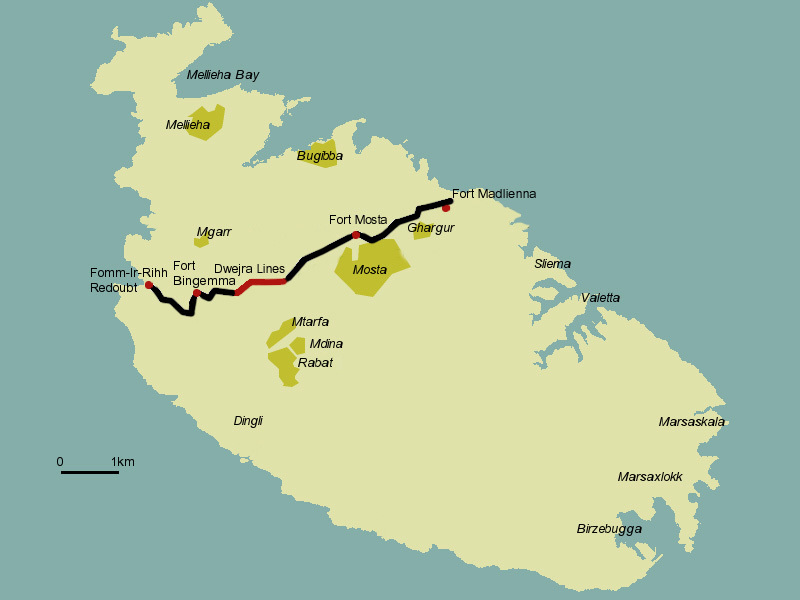 A mere twelve years after completion, military exercises revealed that the Victoria Lines were of dubious military value and by 1907 the line, with the exception of the forts, was practically abandoned. Decay quickly set in and parts of the wall were destroyed to make way for later development. However there are still long stretches along which one can wander and these make for some interesting exploration, apart from the views which the line naturally enjoys. 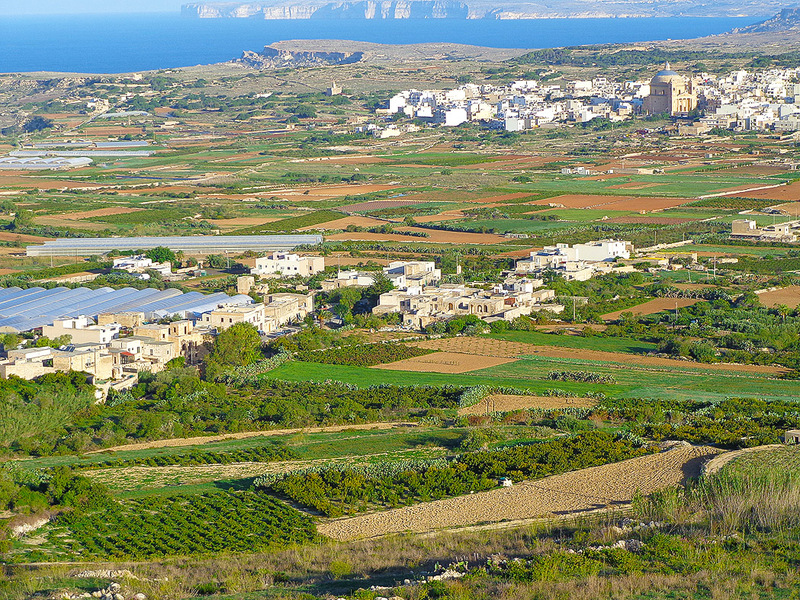 The area known as id-Dwejra to the northwest of Mosta has arguably the best part – a 2 km stretch running to Bingemma with great country views toward Mgarr. Along this stretch one can still see numerous gun emplacements and at Bingemma the wall stretches impressively across the valley near the hamlet’s small chapel. To the north of Gharghur there is another well-kept part of the wall which one can follow. Here too the line zigzags along a dry valley. Another interesting stretch is at Fomm ir-Rih, reached via the small hamlet of Kuncizzjoni. Here at the wall’s western end one can descend to a redoubt and a small barracks, both derelict and showing signs of wear but nonetheless evocative in their abandonment. 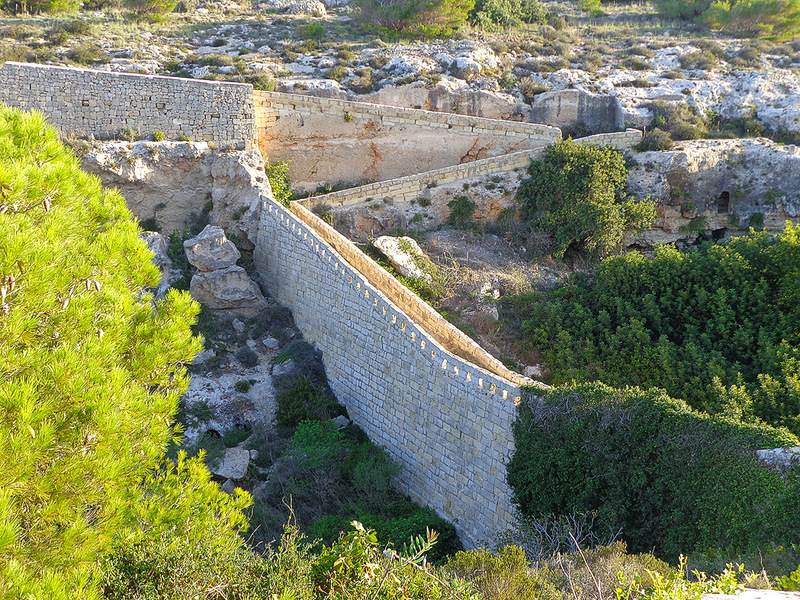 The great wall of Malta, as it is sometimes called, was proposed to UNESCO for consideration as a World Heritage Site by the Government of Malta in 1998.